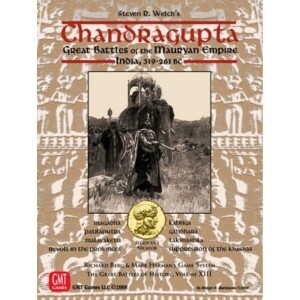 Ancient India comes to the Great Battles of History with Chandragupta, the thirteenth volume in the award-winning game series. From Chandragupta Maurya's first victories over the Nanda clan to his expulsion of the Seleucids from the Indus river valley, the game traces the rise and expansion of India's mightiest empire. Chandragupta features rules for both regular and Simple GBoH play. The battles quickly introduce the traditional "four-fold" division of the Indian military system, where the mighty elephant reigns supreme and ranks of battle chariots maintain an anachronistic prestige. And players will be challenged to grapple with the unique Indian military hierarchy - the loyal Maulas, the mercenary corps, as well as the unpredictable tribal and independent trade militias. An array of armies awaits your command, including the Mauryans, Nandas, and Kalingas, Greek Phalanx and Hoplite armies, and a colorful assortment of tribes and militias. The eight battles offer a variety of gaming possibilities, ranging from set-piece battles to assaults upon mountain stronholds, camp raids, night actions with ambushes, and even urban street fighting. 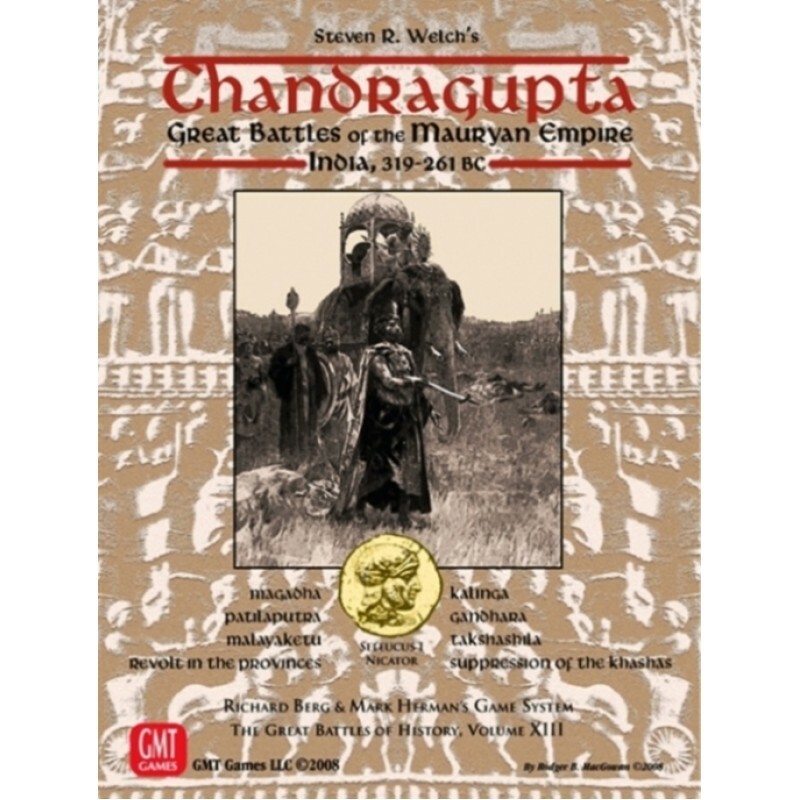 With full-color maps featuring an Indian military camp and the ancient city of Takshashila, Chandragupta promises to be an exciting new addition to the Great Battles of History series. Pataliputra (319 BC) - With a cadre of mercenaries and malcontents, a young Chandragupta brashly attacks the Nanda capital under the leadership of his mentor, the Brahmin Chanayka,. Introduces Dharmayadda rule. Maghada (317 BC) - Led by the formidable general Bhadrasala, the Nandas confront a resurgent and more powerful Chandragupta. Includes camp assault scenario. Mayalaketu (317 BC) - Surprise night raid, Chanayka attacks the turncoat general Malayaketu and his rebel army in camp. Night fighting, surprise, and Tribal treachery. Takshashila (316 BC) - The Thracian general Eudamus, allied to Indian king Ambhi, defends the city of Takshashila against Chandragupta's assault. Set-piece battle with a city assault scenario, artillery and elephants. Gandhara (304 BC) - former officer of Alexander the Great, now "Master of Babylonia," Seleucus I Nicator crosses the Indus river to invade Gandhara and is confronted by the Mauryan army at the river's banks. Revolt in the Provinces (275 BC) - Chandragupta's grandson, Ashoka, brings a relief force to rescue the aging Chanayka who is holed up inside Takshashila. Will Ashoka lift the siege in time to reach Chanayka?. Khashas (274 BC) - In 274 BC Chandragupta's son, Bindusara, puts down a confederation of independent Khasha kings with an attack on their mountain strongholds. Kalinga (261 BC) - The most famous battle of Ancient India, Ashoka's army attacks the kingdom of Kalinga in a huge - and bloody - set-piece battle.